Born as Pema Dorje, Gendün Drup who was posthumously given the title of First Dalai lama. He was born the son of Gonpo Dorje and Jomo Namkha Kyi, nomads from Gyurmey Rupa near Sakya in the Tsang region of central Tibet. 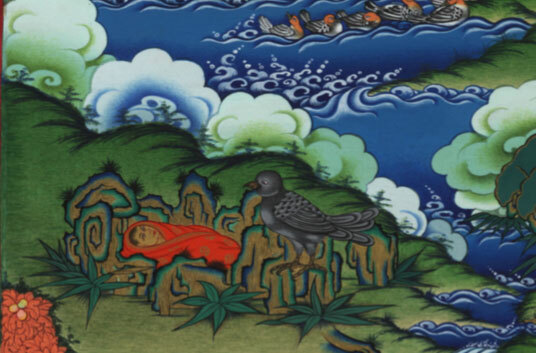 Pema Dorje lived the life of a shepherd until the age of seven when, showing early inclination for a religious life, he was sent to nearby Narthang Monastery where he took his novice vows in 1405 from the abbot of Narthang, Khenchen Drupa Sherap, who gave him his ordained name, Gendun Drup. Narthang Monastery had been founded by Atisha, the Indian Pandit who had travelled to Tibet from Bengal in the 11th Century and established the Kadampa school of Buddhism. Gendün Drup took his bikshu (fully ordained monk) vows at the age of twenty from the abbot of Narthang Monastery. He remained there for five years, studying under a number of famous scholars, and then travelled to Central Tibet to study under the great scholar and founder of the Gelukpa School, Je Tsongkhapa (1357–1419). 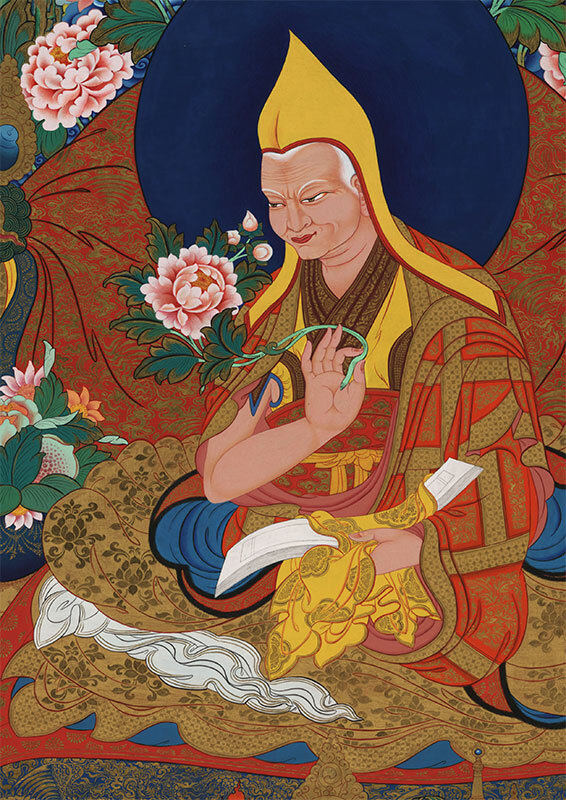 Je Tsongkhapa founded Ganden Monastery near Lhasa in 1409, and appointed Gendun Drup as its first abbot.By the time he reached his thirties, Gendün Drup was one of the most highly respected religious figures in the country. 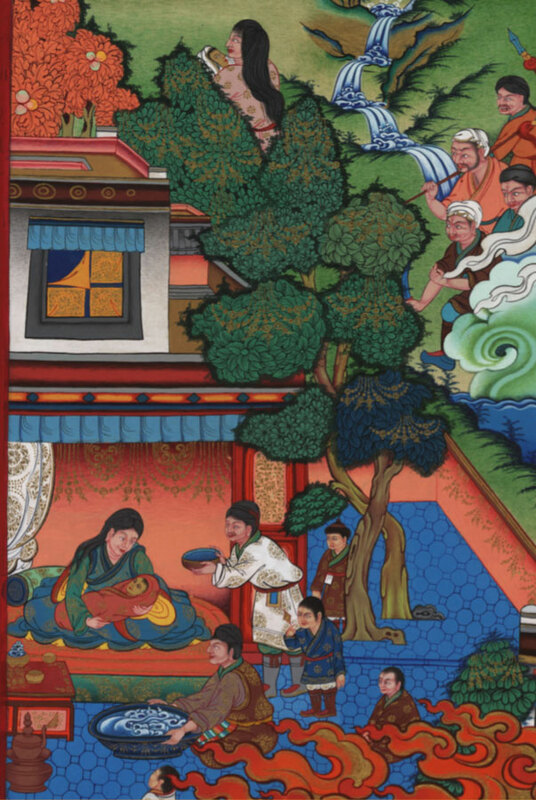 Tradition states that Palden Lhamo, the female guardian spirit of the sacred lake Lhamo La-tso, promised Gedun Drup in a vision that she would protect the reincarnation lineage of the Dalai Lamas. Gendün Gyatso, the Second Dalai Lama, continued this special relationship with the deity, and discovered the lake. Later, it became a tradition for monks to meditate before the lake when seeking visions the find the next reincarnation of a Dalai Lama. Temporal power was endowed to the Dalai Lama lineage only at the time of the Great fifth, in the 17th century. At the time of Gendün Drup, Central Tibet was politically in the hands of the Phagmo Drupa dynasty, patrons of the Gelukpa Tradition. When Je Tsonkhapa’s main disciples passed away the Phakmo Drupa King’s influence had waned. 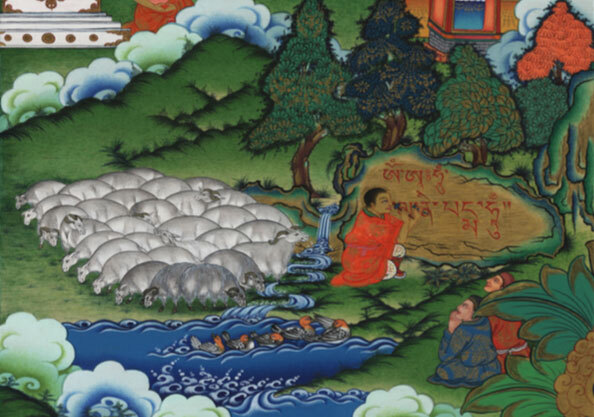 Gendun Drup through the founding of Tashilhunpo, a great monastery in Tsang later to become the seat of the Panchen Lamas, was able to establish an important area for Gelukpa learning in an area where the Gelukpa tradition had not yet flourished. 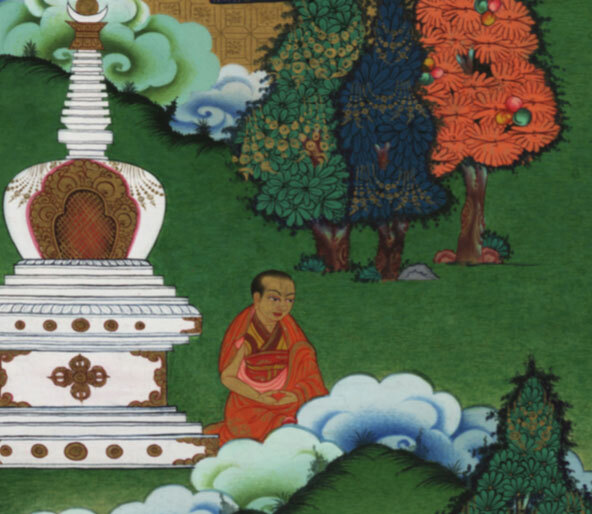 Gendun Drup remained the abbot of Tashilhunpo Monastery until his passing in 1474 at the age of 84. A great black raven stands guard on the Dalai Lama. As a shepard, he carved the mantra Om Mani Padme Hum in the rock. The young Dalai Lama meditates by a stupa after having entered Narthang Monastery.